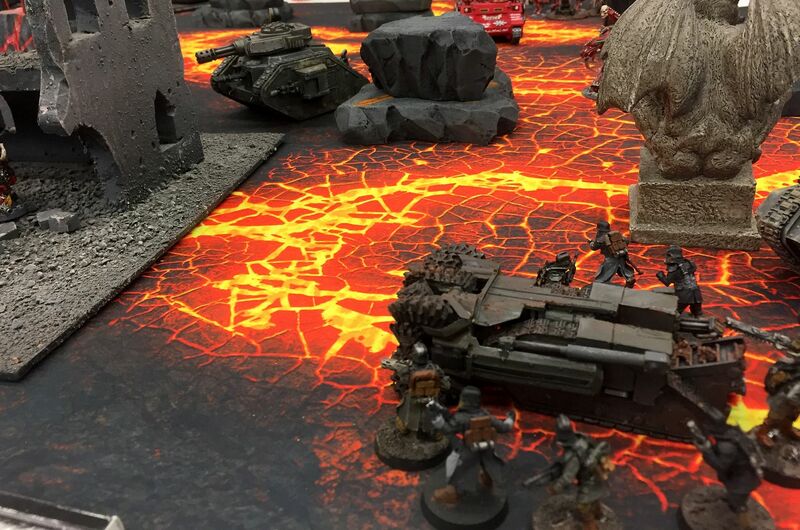 Two more weeks of the Konor campaign, weeks 4 and 6. 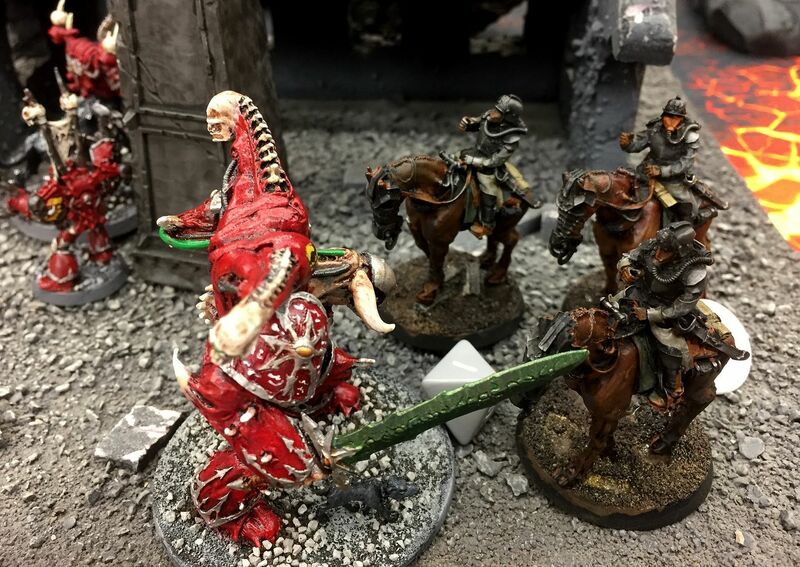 The Word Bearers continue their erratic efforts in aid of the Death Guard's efforts in the system...or are they just pursuing their own goals? Week 4 - the Imperial forces are pushing to destroy the Chaos monuments. Don't they know that they're not about celebrating the Horus Heresy or the trillions killed, enslaved and damned during that time? They're about heritage, not heresy! But Scott's Death Korps of Krieg does not care about that, being a bunch of jack-booted, gas-mask wearing Anticha thugs. The DKoK concentrate in one corner and commence an armored push. 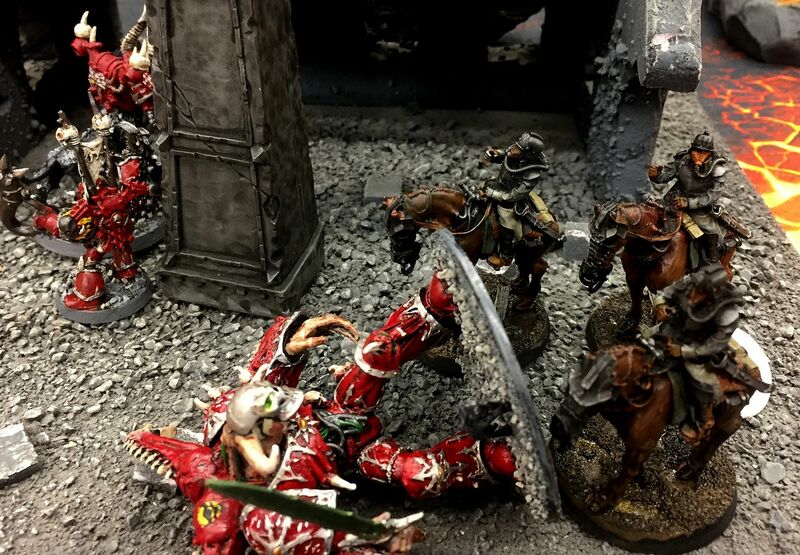 Engineers emerge with a siege drill and are met by the Chaos leaders, while other Word Bearers try to blunt the armored assault. 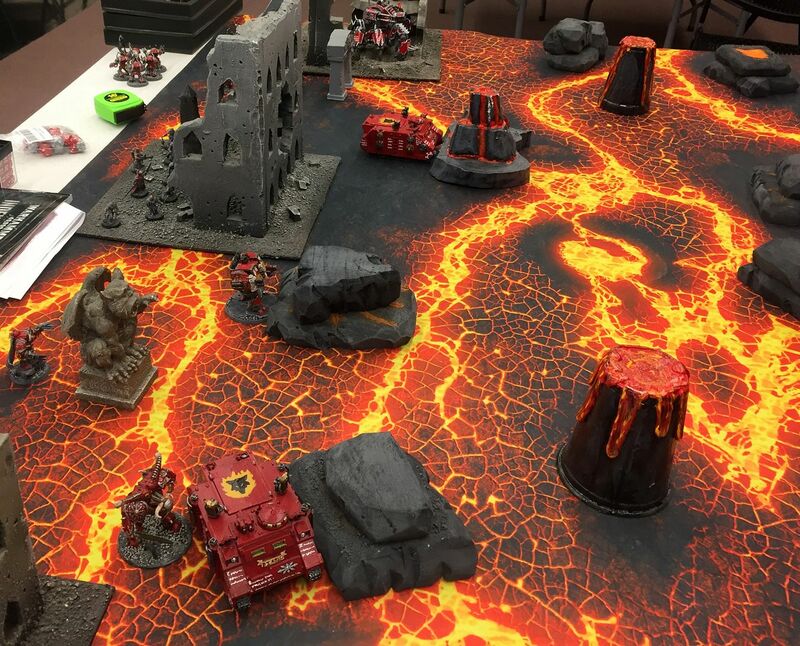 Chaos Terminators arrive, trying to accomplish what the marines could not. But Krieg is implacable! More engineers arrive and help overrun the first monument. 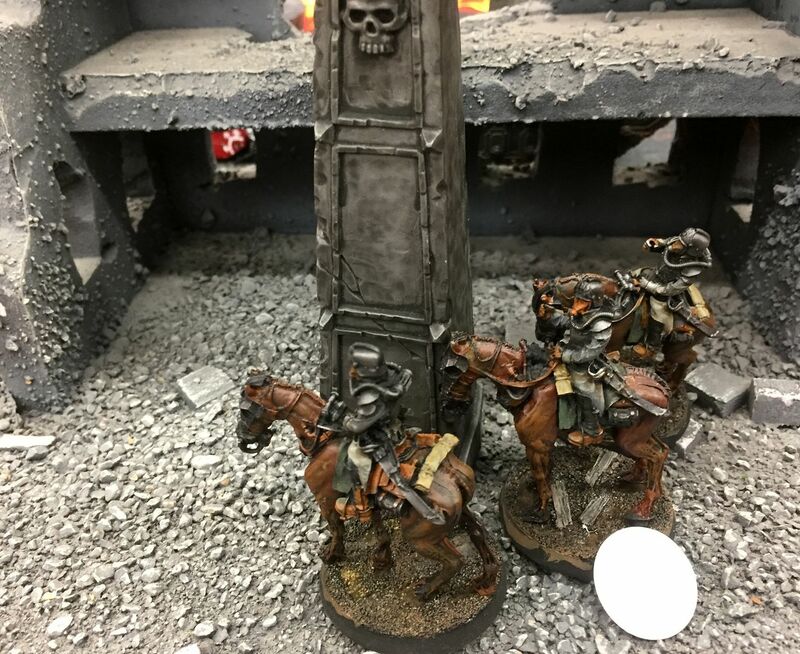 Defiler hangs out on one monument, Krieg has overrun one, prince tries to keep Imperials away from the middle one. Surviving Death Riders make a play for the middle monument, but the Prince is waiting. Unfortunately he slips on something and falls right into their hunting lances. Oops. 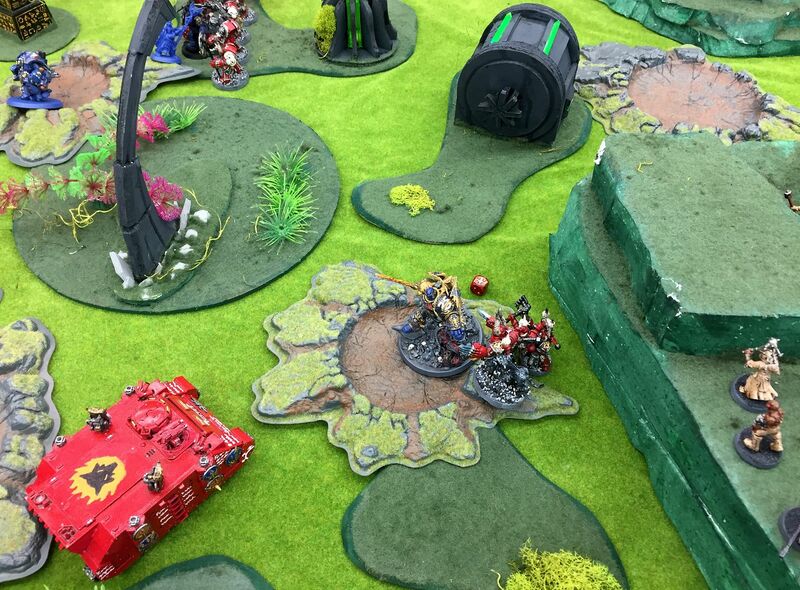 Dispatching the remaining chaos marines in the area, the riders secure the second monument and the win. Imperial victory! 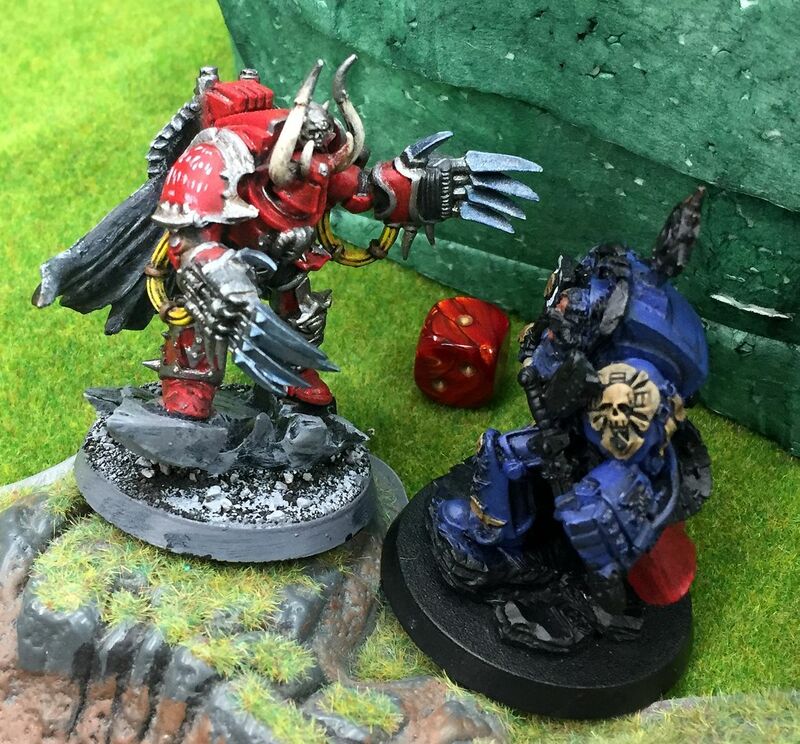 This week, another Konor battle, this time with my Word Bearers vs. sonofsonsoftaurus' Ultramarines. 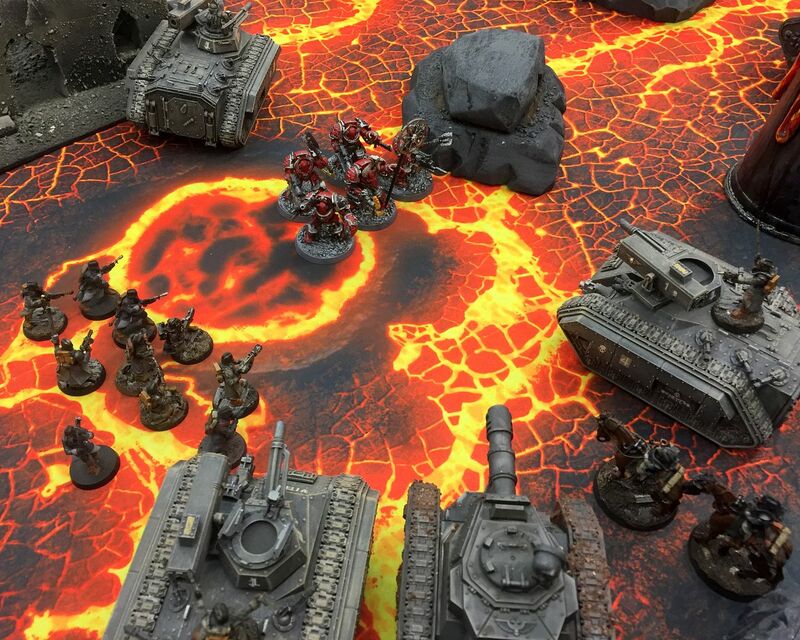 With Guiliman, Calgar, and Tigerius the Ultras have pulled out all the stops. 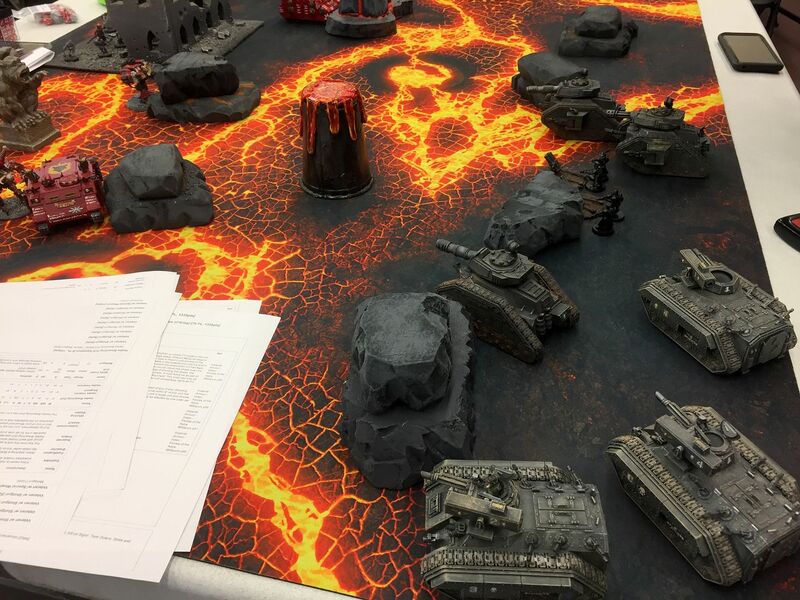 Once again Chaos is on the defensive, this time defending three objectives that the Imperials can destroy when they get control of them. 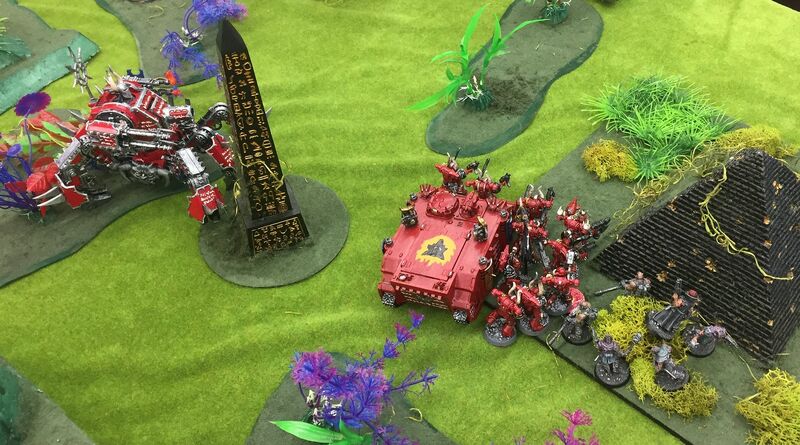 The Word Bearers surge forward, seizing the initiative. 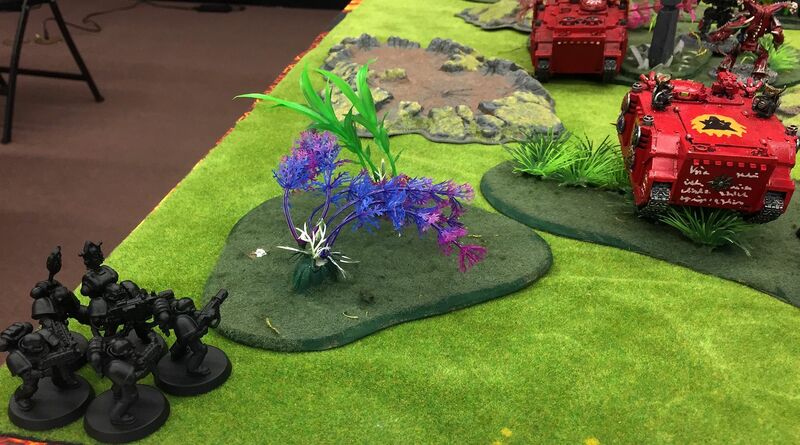 A vindicator round destroys two Centurion Devastators. The dreadnought tried to finish off the third, but his fire was inaccurate and he failed the charge. 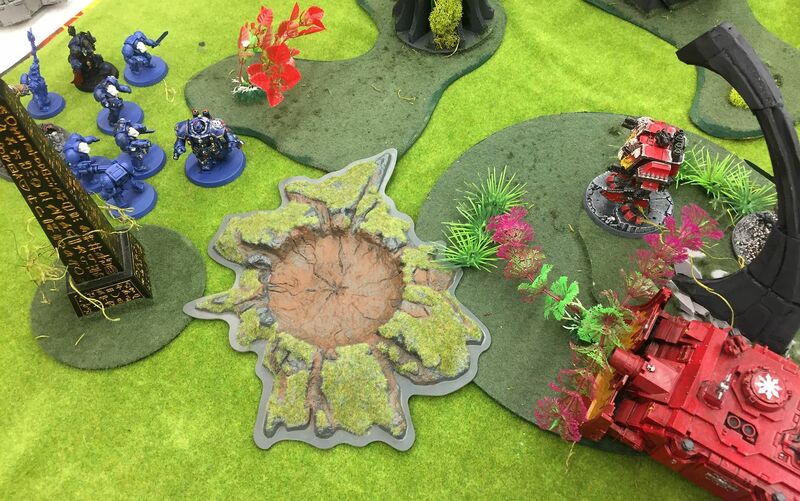 Legion of the Damned appear in the corner but fail to destroy a rhino. 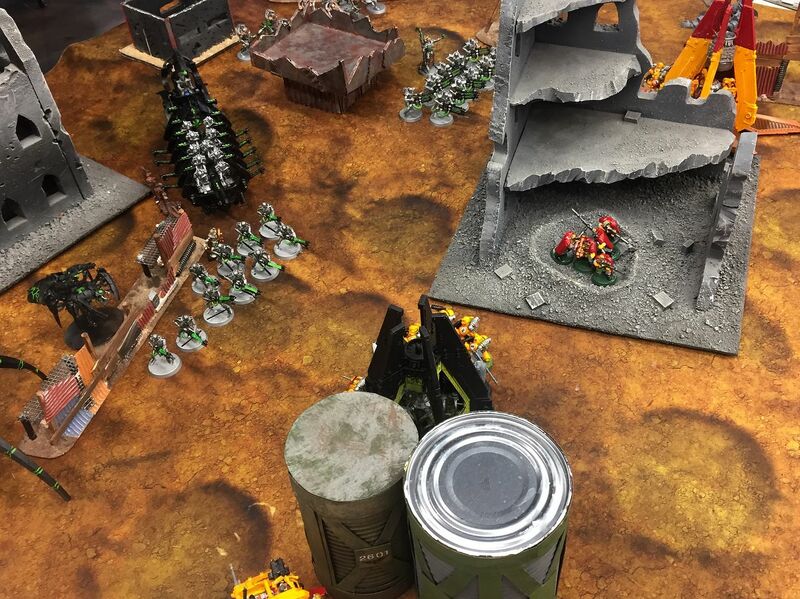 A drop pod with more marines slams down to take the fight to the cultists on my right. 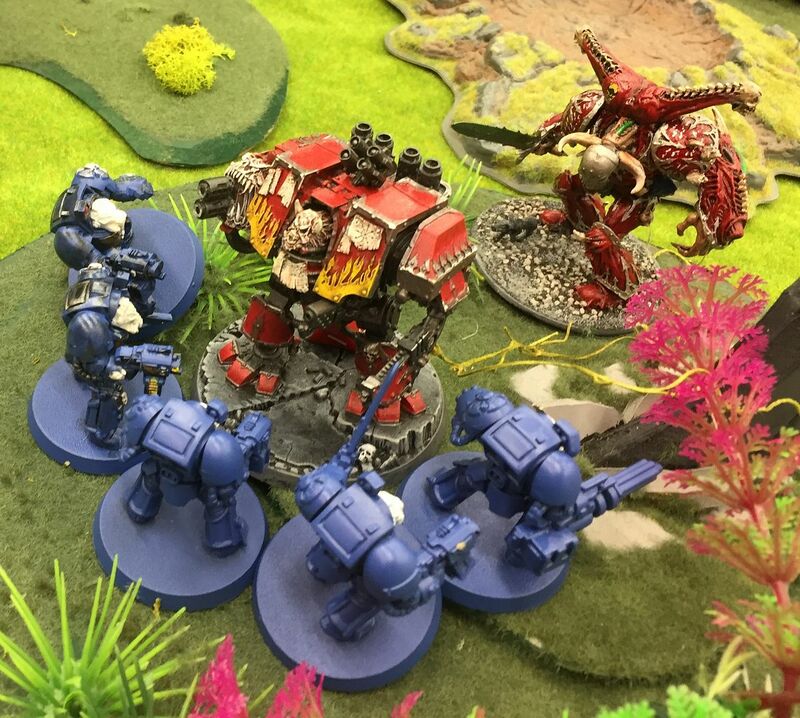 Terminators charge the Word Bearers dreadnought while the Daemon Prince Garm looks on. 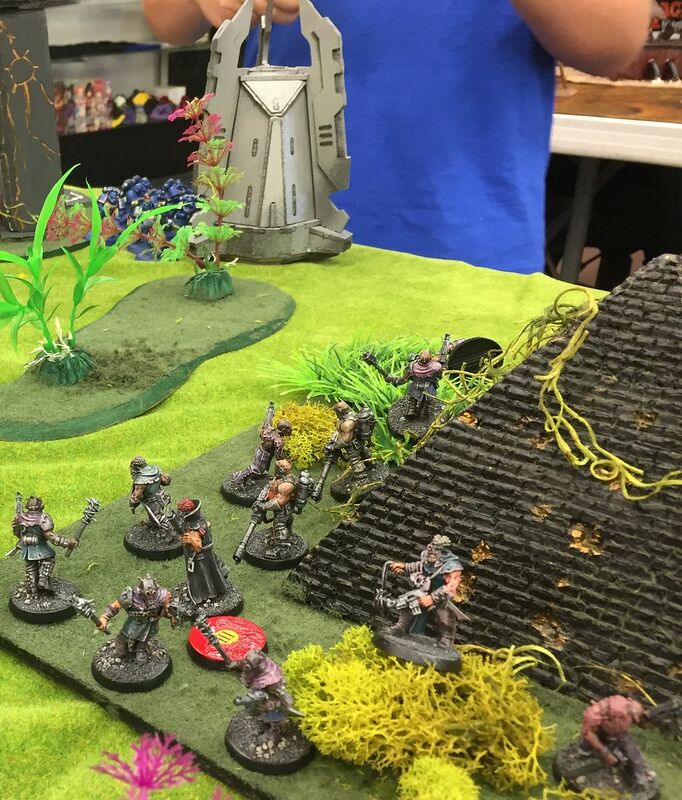 Chaos terminators teleport in flanking the Ultramarine firebase. 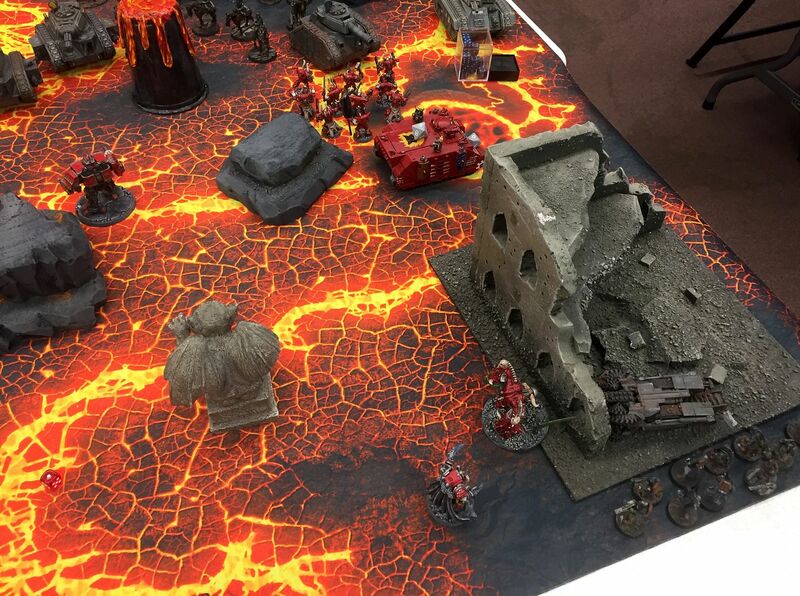 Melta fire kills the techmarine on the thunderfire cannon. 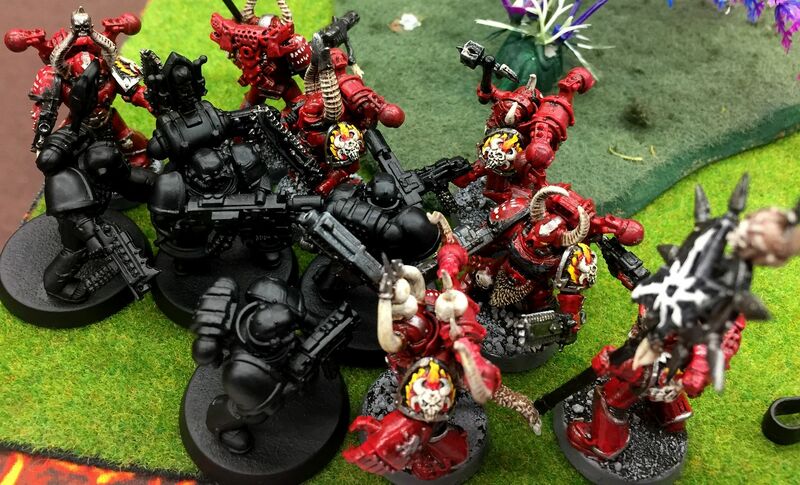 Chaos marines assault and tie up the Legion of the Damned. Having seen the ease with which the terminators destroyed the dreadnought, the prince retreats behind the Chosen's rhino. Guilliman charges and destroys the Rhino, which explodes doing serious harm to himself and the nearby prince. 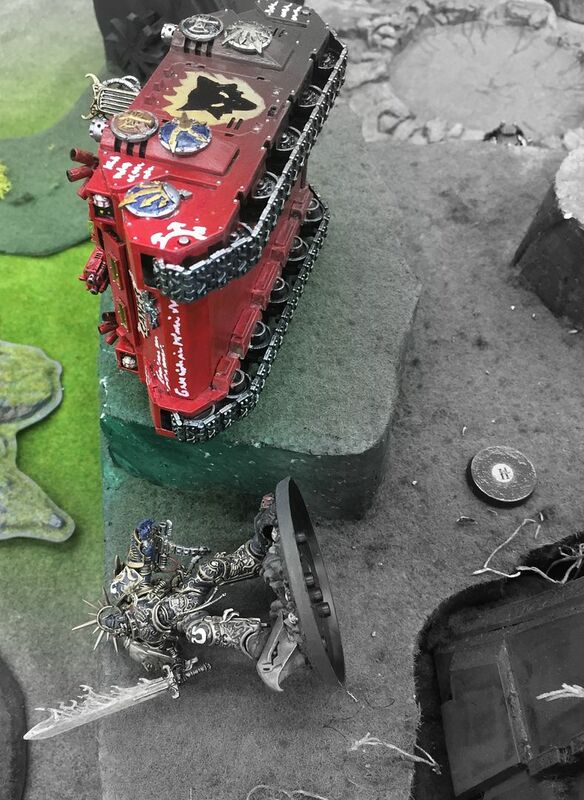 Apparently the Word Bearers had packed the vehicles with explosives. 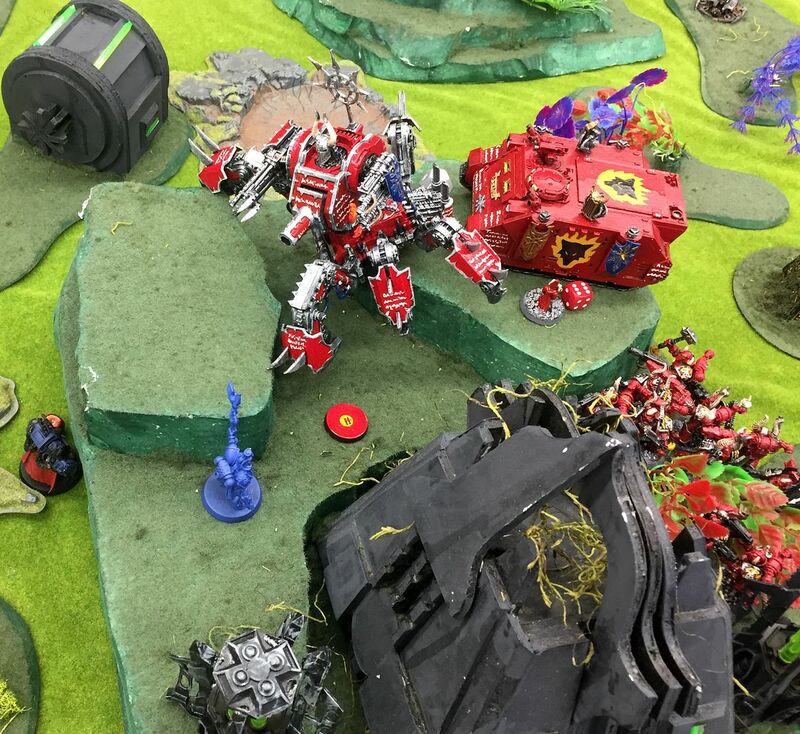 Terminators charge the prince but a combination of the explosion and the prince using command points to interrupt them sees them off. Chosen managed to all pile out before hitting the detonator. 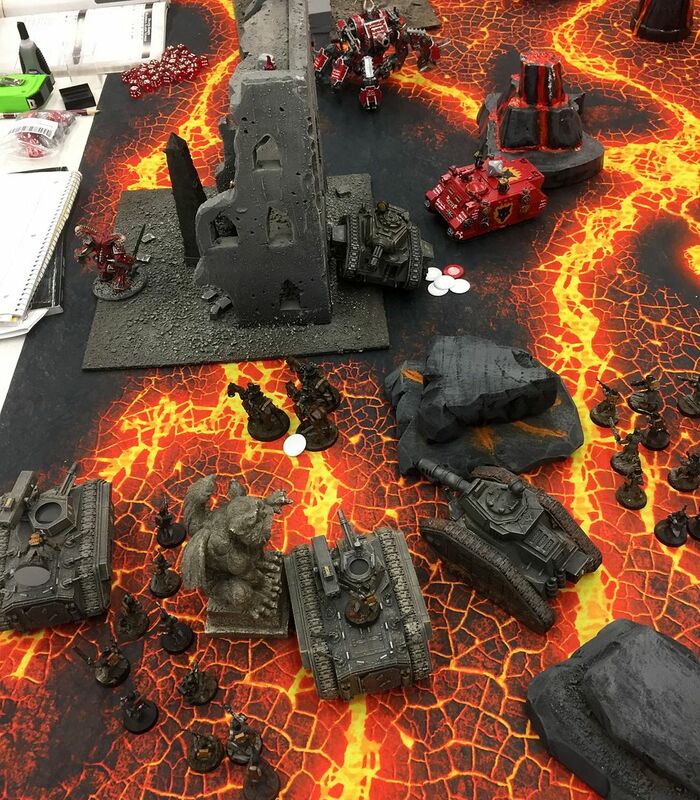 Before the smoke fully clears the traitors are hurling themselves at the primarch even as he shrugs off the remaining debris. Force fields dissipate the incoming melta shots and then the scrum is on. But Guilliman demonstrates the power of a primarch in battle, dispatching the prince with a quick blow carving him in half, then continuing the sweep through most of the Chosen. 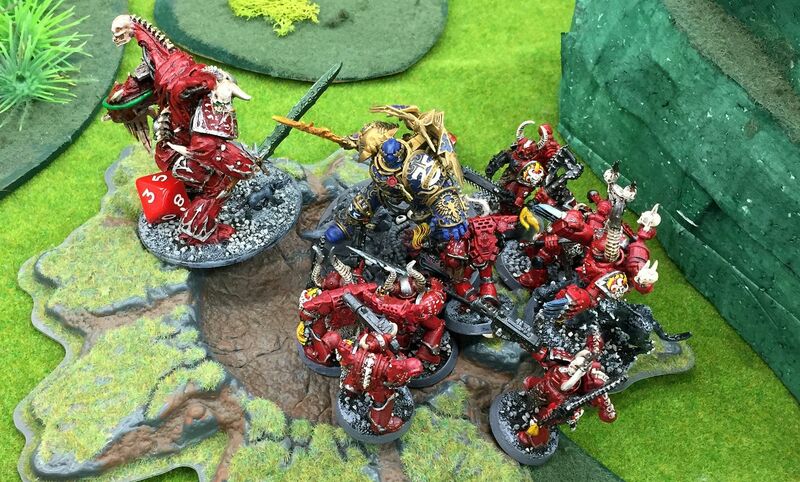 Above, chaos terminators have charged Calgar, with similar if not as spectacular results. 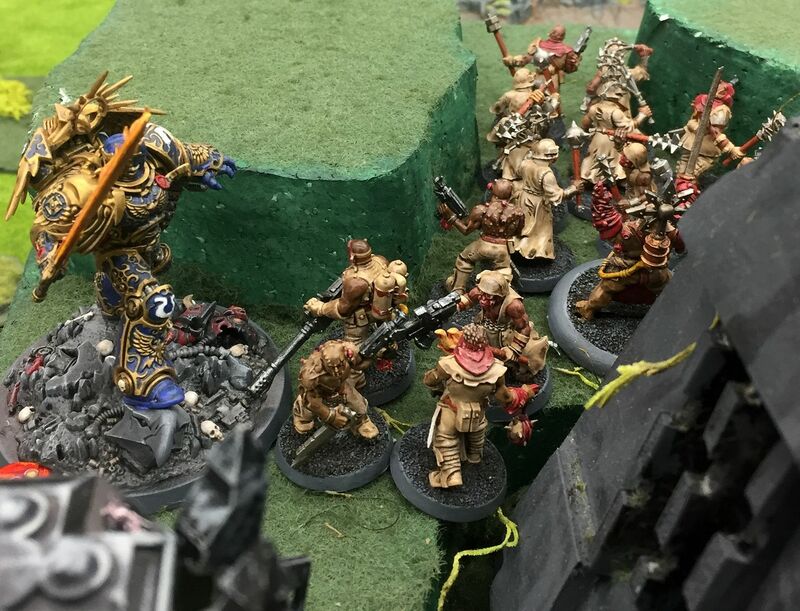 Guilliman disengages from the remaining Chosen, casually avoiding their attempts to restrain him. 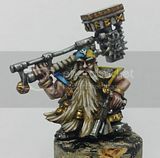 He sprints to one of the objectives and with a burst from his gauntlet destroys it. On the other side of the battle, the traitors have cleared the threat. Can they hurry to block the primarch in time, or have the marines successfully delayed them long enough? Half leaping, half climbing, the primarch barrels into the cultists guarding the middle objective. 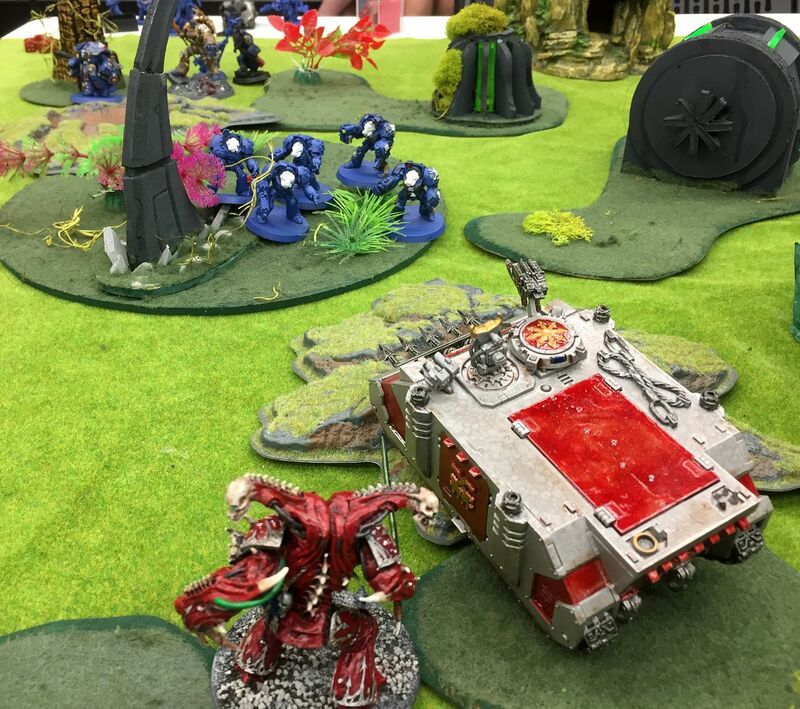 A whirlwind of death, the lord of Ultramar leaves only a few bewildered survivors. Another rhino guns its engines and charges into the primarch as well. 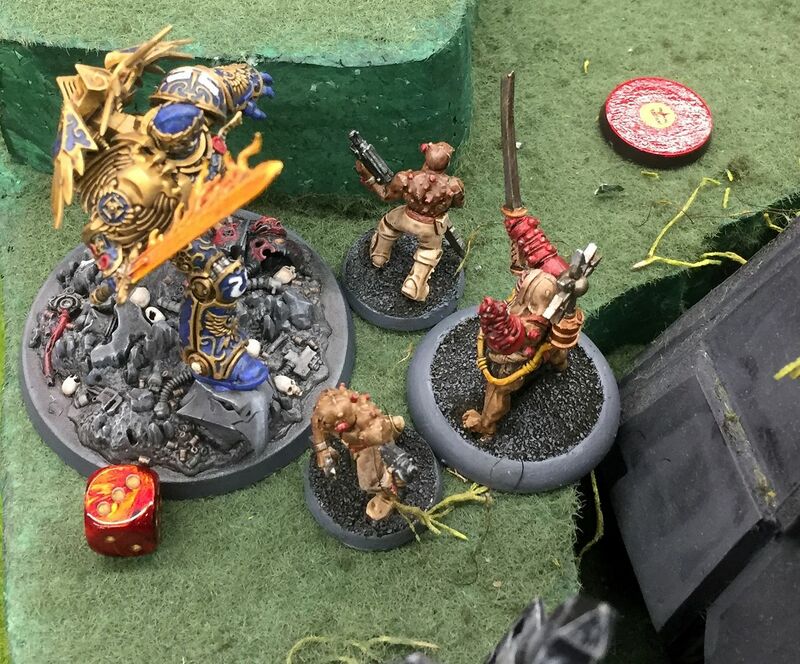 Guilliman tears it apart, thrusting his sword into the driver and activating the deadman switch. The explosion hit Guilliman for three mortal wounds, finishing him off. He failed the roll to return, even with a command point reroll. Primarch down! Below, the chaos lord charges into Calgar but is slain. He does manage to slow Marneus down enough to keep him from getting to the objective. 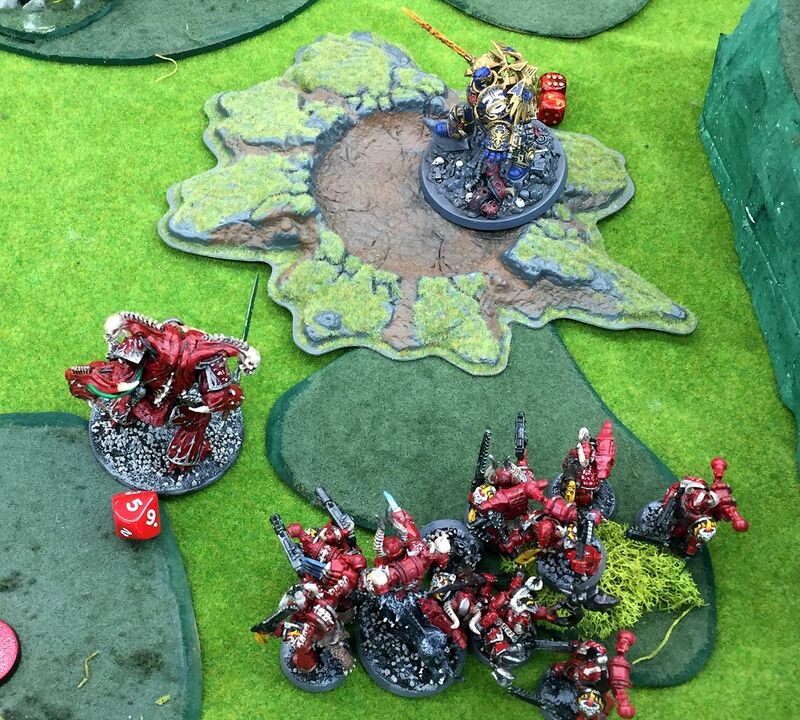 Tigerius tries to take out the objective, but is forced to fall back as a tide of Word Bearers rolls up. He does manage to activate a teleport beacon, transporting the primarch's body back to the command ship's orbiting apothecarion. Meanwhile, other games were going on. 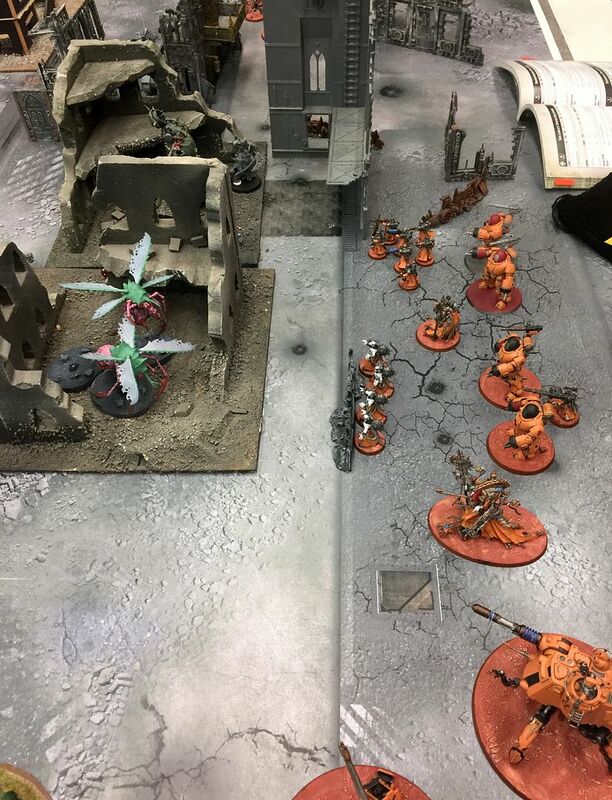 Matt's Death Guard was trying to fight off Tom's AdMech, and Leonard's Imperial Fists assaulted Conor's Necrons. 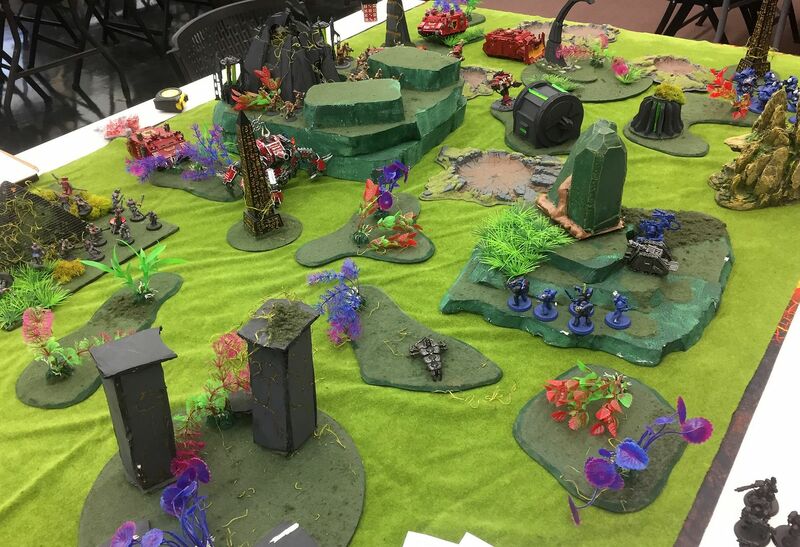 Hot Chaos on Chaos action!